File and Printer Sharing is on by default in Windows XP Home and Pro editions, leave this on if you need to share your files with another Computer. If you do not share files, Turn it OFF, by unchecking it, in Network Connections. Check out my Network Connection page, for more information. This is cool, to show those hidden programs in XP go to C:\Windows\inf folder and open the sysoc.inf file in Notepad.To see this Folder, because it is a hidden folder, go to Windows Explorer- Tools-Folder Options-View Tab and check the Show hidden files and folder box, Apply and close. Once you have the inf file open it will look the the text below. To Unhide something remove the HIDE, save it and whalla, it will show up in the Add/Remove Utility. Here is the line to change with the HIDE and then without it. 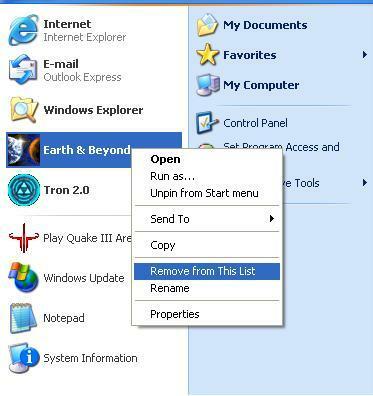 To Remove something from your Start Menu right click on it and choose Remove from This List or Unpin from Start Menu. As shown in picture to the right. 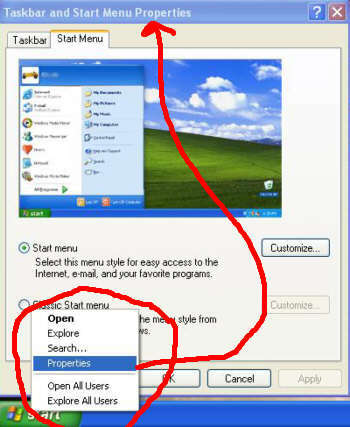 If you want to Add a shortcut to the Start Menu right click on it and choose Pin to Start Menu. Where are the Properties for the Start Menu, right click on the Start button and choose Properties and you get the Taskbar and Start Menu Properties. Tweak away, on the first page shown, if you choose the Clasic Start Menu option, it will look like 98. Where is System Backup in XP Home ? If you want System Backup on XP Home Edition, you will have to Manually install it off the Windows XP Home Edition cd. 3. When the wizard is done, click Finish. You can still turn off those Startup Programs. If you mess around in the registry, use System Restore and set a Retore point, just in case !